As PC repair techs, we’re often called upon to troubleshoot issues such as Wi-Fi network issues, such as low signal, no connectivity, and so on. There are many many apps related to network testing, exploration, security analysis, and basic troubleshooting. Many of these are included in the Linux distro BackTrack, a favorite among those who work in penetration testing and network security infrastructure. 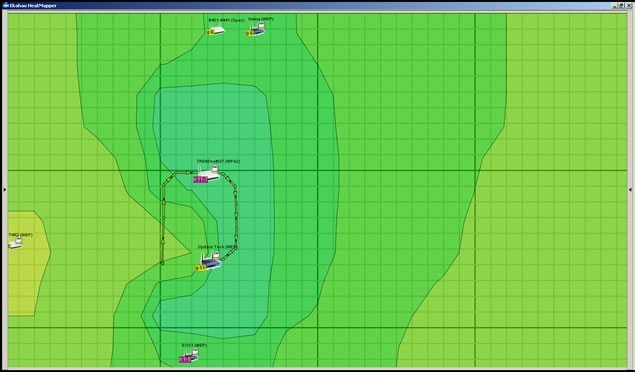 However, in this article, I’d like to highlight two Wi-Fi testing and mapping apps for techs, both of which are freeware. They are invaluable for wireless network mapping, and should be included in every tech’s toolkit. Depending on what you use in the field, laptop, netbook, tablet, or smart phone, and depending on the area you’re analyzing, one or the other might be more useful. Both support 802.11a/b/g/n, as well. 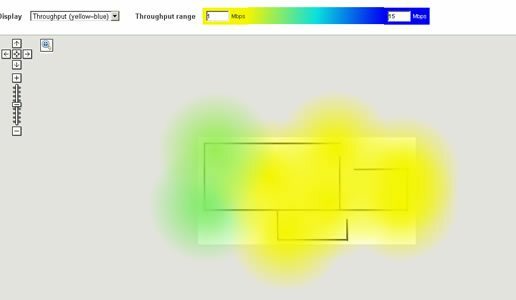 HeatMapper requires a device running Windows, and only takes a minute to install. There are two mapping options. You can upload a floor plan image, a screen-shot of a geographical map of the area you’re testing, or any other diagram that could be used as a floor plan. 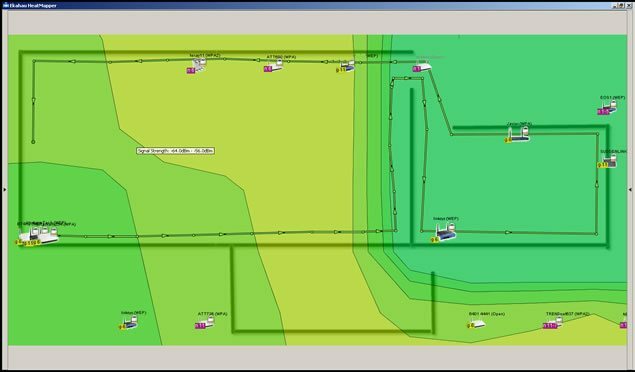 Alternatively, you can use the ‘grid’ option, which is basically a basic grid that you use to map your own ‘floor plan’ for network mapping. After you choose your option, you’re shown all available networks, and you can click on the area, and start walking. As you continue walking around the area you’re mapping, continue clicking at intervals to provide location coordinates to assist in accurate mapping. 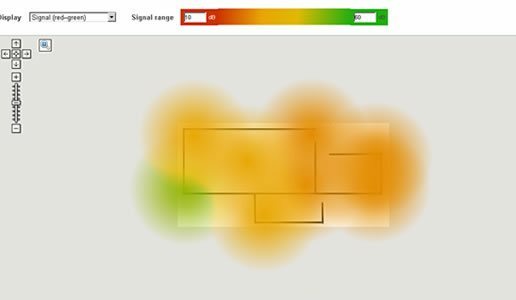 HeatMapper will show the Wi-Fi coverage, including all access points, their security settings, their channel, speed, and more. It should work with any built in network adapter, as well as external wireless adapters. I’ve found the speed with which it maps target areas to be exceedingly fast, compared with some other testing apps I’ve tried. It’s very accurate at locating network access points, based only on signal strength and the coordinates you provide by clicking on the map or grid as you walk. I should mention that this app limits your continuous site survey to 15 minutes, but it will probably be a rare occasion that you’ll need to spend more than 15 minutes walking through your testing area. If you have more than one floor, you’ll probably need to have a floor plan image for each floor. If you try to put all floors on one floor plan image, it’s not likely to come out very well. Instead, the signal strength lines will probably end up skewed and out of alignment. At the end of each survey, you can take a screen-shot, and keep the image for reference in your results. I found Meraki’s WiFi Mapper very useful as well. It’s a browser app, but it can also be used even when you’re not connected to the internet. As a browser app, it will function on most tablets and some smart phones as well, and this is where it really shines. Google Map integration is included, which means you can pull up your location on a Google Map, and simply start clicking as you walk around, pausing as it tests. You’ll notice it’s not quite as speedy as HeatMapper, but what it lacks in speed is made up in other features. After signing up for an account, you can upload floor plans and use them as maps. Unlike HeatMapper, here you can upload a floor plan image with several floors on the same map, and use the same map during the whole survey. The interface is very easy to use, and I found the color coding feature has a very professional look to it, and it’s easy to locate spots with very low signal. WiFi Mapper is only in the beta phase, which is very promising, considering what it currently offers. There doesn’t seem to be any time limitation on the site survey, which also favors those who need a multi-story site survey. However, I do recommend that while you’re walking around and clicking to provide coordinates, stop walking while it runs the test for the coordinates you just provided, to provide better accuracy. I’d recommend going to Meraki’s site for WiFi Mapper, and over here for HeatMapper, just to check them out. Meanwhile, talk a walk around your office or business, and test your network coverage with whatever mobile browsing device you have handy. Do you have a favorite Wi-Fi testing app you frequently use in your work? Leave a comment! This past weekend, The Force Field lost an Admin and a friend. Renee Wright passed away. Renee, who was known on our site and forums as Genoagirl, died August 18 after a long battle with cancer. She was 48. I knew she was dealing with a health issue but I wasn’t sure about the specifics. I had not spoken to her in awhile, so her passing came as a bit of a shock. I first met Renee in the OnForce Forums sometime between 2005 and 2006. As a female in a male dominated platform, she held her own and quickly gained the respect of her male counterparts as a capable IT professional. She became an OnForce forum moderator and her dedication and common sense approach impressed me so that when I founded The Force Field portal, I made it a point to ask her to become an Admin. It turned out to be a good call, because her presence and influence became a great asset to The Force Field community, especially in its early days. Renee was indeed instrumental in getting these forums up and organized, and she kept them in order, especially in the early days. She wasn’t always out front in the forums, but she was there, working quietly behind the scenes, and whenever there was a call to action she was usually the first to respond and do whatever was necessary to make things happen. Renee had a lot of friends here. She was well liked and well respected by her peers. Forum communities tend to become highly charged and even volatile at times, and personalities tend to get in each other’s way. Renee tended to avoid getting caught up in such conflicts and always kept it professional. She moderated with a firm even-handedness and was quick to help calm a tense discussion. Folks liked her quiet, professional approach and engagement in discussions. She helped keep the peace in the community. She was never hesitant to contribute when the need arose and she often did so proactively. She monitored the web site and forums closely, sometimes more so than I did. It was not unusual for me to log in late at night or early in the morning and find her online, checking up on the site or performing some task. There is something else that most members are not aware of. Renee put a lot of work into the back end of the portal on the administration side that probably no one else knows about and likely no one will ever see. She also contributed to the ill-fated wiki and was one of the few to actually take an active interest in it. There was no doubt that she took her Admin position seriously and with dedication. I will always admire her for that. I also interviewed Renee for The Force Field podcast. If you would like to hear her contributions to the show, you can listen to her in episodes 7 and 10. I do have one major regret. Renee had been absent from the forums for the last year or so and other than the occasional post on Facebook I had not heard from her. I had not checked in on her for quite awhile and intended to e-mail her at some point but kept procrastinating because with everything else going on with the site, it just didn’t seem to take priority. This was a painful lesson for me about putting things off until tomorrow, because as the saying goes, tomorrow never comes. It is rare that I find it difficult to express thoughts and opinions in writing and I am seldom at a loss for words. Today, however, is different, and the right words are not easy to find. I wish I could say it directly to her, but it is too late for that. I will post it here in her memory and honor. Renee, thank you for your hard work, loyalty and selfless dedication to The Force Field. Your contributions meant more than you ever knew and I appreciate everything you did for us and our online community. Thank you for your service as an Admin and thank you for your friendship. May God be with you and your family. Update: I was informed by her sister that the funeral will be held Wednesday, August 22, 2012 at 11 AM at the Robinson-Walker Funeral Home, 501 West St., Genoa, OH 43430. Interment will be at Clay Township Cemetary and a wake at Rayz Cafe in Genoa will follow. We respectfully ask members and friends of The Force Field Community who would like to honor the memory of Renee Wright (Genoagirl) to participate with a donation to The National Breast Cancer Foundation. Cobian Backup is a program that allows you to schedule and bacup fils and directories to other directories or locations in the same computer or another machine on a network. The program is multi-threaded, works in both download and upload using few resources. It comes in application or service versions. Cobian Backup is a FREE download. ScreenConnect is a self-hosted remote support solution developed by Elsinore Technologies that not only helps you service your customers, it can also be customized to promote your brand. FREE 30 Day Trial. D7 – The Ultimate Technician Tool Every Tech Should Have! We all have our little USB toolkits, our ‘ultimate’ CD’s, our repair disks and other related repair tools. Most of us like to have a comprehensive list, a solution for every possible problem we could encounter in the field, to the extent of carrying around drivers for common hardware in the rare case there is no reliable internet connection near the client. The issue with having a comprehensive set of tools often means you have to search through your tools for the one you need, and once you’ve located it, run it, and then search for the tool you need to use next. You may have a routine you would like to automate, but instead you sit there at the computer and babysit the mouse, clicking once every 5 to 15 minutes to close something, affirm something, or perform some other menial task. While automation is a partial solution, there is a much better solution that has been available for about a year in the tech sector, about which there have been some recent improved developments. It’s been mentioned on Technibble and Podnutz before, but it deserves full coverage. Enter D7, the ultimate technician tool, from Foolish IT, LLC. What is D7, and what does it do? Perhaps a better question would be: What doesn’t it do? It has everything from ‘one-click’ malware removal automation, Windows repair and maintenance, backup, restoration, and migration of data, as well as a slew of system tools, shortcuts to commonly used tweaks and configurations in Windows, and much more! It can keep your tools updated, yet is fully portable. Yes, you can put it on your UBCD4WIN drive and run it from there. A note of caution is in order, however. This is not a tool designed for consumer use. This is strictly for Tech use. The rest of the tools in your kit might be hacksaws, maybe even circular saws. D7 is the V8 chainsaw of the Tech world. It can do a lot of damage if you don’t know what you’re doing with it, and that is why you can password protect it when you leave the client’s computer, so that they don’t inadvertently find it and toy around with it when you leave, requiring you to return and repair the havoc they might have caused. Seriously, though, what does it do? The official web site (www.foolishit.com) has some good info on how to use it and configure it if you’re new to the tool, but for starters, it offers offline and live malware removal assistance through internal tools as well as third party tools you can customize yourself. It will automatically download and extract those tools when they are missing, and you can configure it to update your tools with the use of Ketarin. It’s a registry editor with a mass search and delete feature. It’s a data migration tool, with backup and restore features as well. 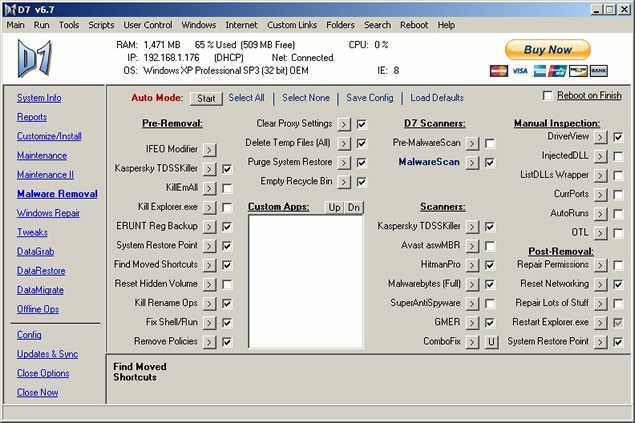 It’s a networking swiss knife tool, with handy shortcuts to commonly used components in Windows that we use often, but tire of locating the long way through the Windows OS. Command line tools are condensed into ‘one-click’ executions, so you can forget needing to remember all those executable names and extensions. It also includes password removal features, and is more or less the equivalent of a virtual locksmith. Let’s take a look at version 6.7, the last ‘free’ D7 version. (I’ll discuss more about this later, this has to do with the recent developments regarding D7.) On the left side, you’ll see the tabs you can click on, such as Reports, where you’ll find info reports, malware logs, and can perform screen captures and access them. On the Customize/Install tab, you can change host files, update third party apps, and work with dSupport. The Maintenance tab covers everything from Time Zone checks to system cleaning tools such as deletion of temp files, internet files, cookies, history, toolbars, BHO’s, and registry cleaning tools. The Maintenance II tab has many more utilities you can use to test and stress test hardware, check performance, and repair other items such as the Windows Updates feature. The Malware Removal tab covers malware removal assistance, and provides easy ways to recover shortcuts and hidden files after the infection. It includes scanners and methods of fighting malware as well, which you most likely wouldn’t find all in one place like this anywhere else. The Windows Repair tab has a plethora of repair tools for nearly everything you could want, from repairing the firewall, checking system files, using MS FixIt, clearing print spoolers, and much more. The tweaks tab is handy for tweaking features within Windows. Datagrab is your backup tab, and it has some extremely useful features as well. DataRestore is where you work on the restoration of data, and is fairly self-explanatory. DataMigrate is again, self-explanatory, and allows you to migrate user settings, mail settings, and search for specific files with specific extensions, in case they are hidden on the drive. Offline Ops can find keys, restore settings after malware removal, and perform other tasks as well. The Config tab sets up the customized options, Updates and Sync updates your third party tools, and syncs your D7 configuration to a centralized location, and keeps all your D7 drives in sync. All in all, a major comprehensive computer repair utility, and best of all, it’s completely free! If you’ve never used it before, go check it out. Once you’ve downloaded it, simply mouse around inside the GUI, nearly everything has a tooltip that shows up in the bottom of the GUI that describes what it does. The best part of it all is that you can automate nearly every routine of tasks you want to perform! Regarding the recent developments, as of July 30th, 2012, Foolish IT, LLC is partnering with RepairTech, Inc, to create a new revolutionary tech product, combining TechUSB with D7 to create TechUSB Pro. For those serious about computer tech and the repair business, this is a tool you need in your toolkit. It will be a premium product, brandable with your own company name and logo, and include premium features such as uploading D7 logs to your TechUSB Portal online. D7 6.7 is still free to use, although it has some ‘nag screens’ when you try to perform certain tasks. As far as I know, previous versions (with less features) don’t include those nag screens, but if you see this tool being useful in your company, you won’t regret the small price for the usage of the premium version. The company branding feature is sure to impress your clients as well. In summary, D7 is one of those tools you just shouldn’t be without. Remember to protect the client from locating it and toying with it on their own, and you shouldn’t have any problems. Use it wisely, and you will probably wonder how you ever got along without it! Applying security patches to the Operating System of your computer can save you a ton of trouble when fighting viruses and malware. The problem is, as technicians we don’t always go far enough when it comes to patching software and hardware. It’s important to realize that you and your clients are vulnerable from other directions as well. Most clients understand their systems have vulnerabilities, but they’ve been conditioned by one marketing campaign after another that once the operating system is patched they’ll be protected. It’s a given that patches come out for everything from MS Windows to every version of Linux. The problem is, in the rush to protect the ‘main’ system, it’s possible to forget that support software has the same or even worse vulnerabilities. This includes office suites, productivity software, online games, web browsers, document viewer or rendering software, plug-ins, and system firmware – free, shareware or commercial – the bad guys don’t care. It may seem like a no brainer that simply patching the operating system isn’t enough, but how obvious is it really? I’ve been doing this for a long time and I only became aware of how serious the ‘third party problem’ is within the last 3 or 4 years. Clients want the fastest answer to their problems. Most know that if they are using a Windows system there will be patch releases that they have to deal with and that’s as far as it goes for them. They neither know, no care that there may be other issues to deal with. This is one of those things that must be built into your Service Level Agreements’s (SLA) not only to cover you, but to make sure that the client isn’t left hanging. Malware writers are on a constant hunt to find weaknesses in all software and every time a security patch comes out they are immediately find ways to circumvent it. If you’ve worked with your clients for any length of time you have an idea of what’s on their systems. If part of your SLA is doing updates to software or firmware it’s always a good idea to keep a log of what software they have installed, when the last update was done and whether or not any new vulnerabilities have cropped up since your last visit. This is why documentation is so incredibly important. I keep a running log of my client systems that’s only a page long. It has a list of the major and support software that they use on a daily basis. This process can be time consuming to start, but once the basic list is done, it’s easy to update or remove entries. The way I look at it, if this is the first time I’ve sat at a computer I automatically assume that NOTHING has been updated, this keeps me from missing things. Belonging to sites like Technibble or Techrepublic (well, back in the day…) can pay off. Reading articles or being involved in forums can give you a heads up about which software is the current favorite of malware attacks. There’s no way you can know it all, or even keep up with every little change. That’s where a helping hand can be a great thing. I’ve found Secunia PSI to be an invaluable tool for Windows based systems. The software can either be used as a downloaded app which will scan the entire PC on demand looking for software that needs to be updated and then pointing you to the manufacturer for download or purchase. It can also be set to routinely scan the system and give you updates when something has become outdated, but I don’t recommend this setting in a business environment since its likely to slow the PC down. The software can also be run as a web based app, but it will only do a surface scan and can miss programs. Secunia PSI is designed for home PC’s but they do have a version for Enterprise level systems called Corporate Software Inspector (CSI) which is designed to act as a vulnerability scanner with a patch management system running on the back end. The programs work well on Windows based PC’s and the company claims they work well on Apple, but I haven’t been able to test that yet. About the only complaint I have with the software is that it can take some time (5 to 10 minutes) to scan a full HD and report its findings. And then for some third party software you have to visit the company website to get the update or patch. PSI will automatically update most software, but not all. The larger software companies have teams of people looking at their software, finding holes and then patching them. The smaller developers don’t have that kind of manpower or capital, so it’s no surprise that a third party application is going to be more vulnerable. That doesn’t mean that it has to be a crap shoot every time you sit down to take care of a system. It may take some time to develop a solid plan to keep your clients patched and protected, but that time is an investment in your business and the health of your clients systems. Guest Post by Ronn Hanley: Ronn is a technology enthusiast from way back, during the dark ages of the Arpanet and the Purple monochrome monitor screens. His first computer was a Commodore PET and his first laptop was the size of a suitcase. Despite that, he loves computers and technology to distraction and has been working in the tech world for almost 10 years full time, currently as the owner of a Desktop and Network support company in Atlanta, Georgia. How many techs does OnForce really have? A couple of weeks ago I was directed to an article on The SmartVan, a web site aimed at field service technicians. The piece was called Service Outsourcer OnForce Touts ‘Efficient’ Job-Filling Model and was posted Julu 27, 2012 by Darren Weiss, a contributing writer for the site. It is, of course, a marketing piece, but there’s nothing wrong with that. The article itself is a rather straightforward promotion of the OnForce platform. If more techs engaged in this kind of PR for their businesses, they would likely have more customers of their own and rely less on service platforms for work. Marketing is a good thing. I have no issue with that. I do, however, have one issue with this article. It is a chronic issue that really needs to be addressed. When marketing your business, it is important to lead without misleading. Truth in advertising, so to speak. Articles such as this are a powerful marketing tool because the average reader tends to take the author at his or her word and accept what he or she says based on the assumption that the facts have been researched and are, indeed, factual. This is especially important if the author is supposed to be a journalist. The issue is with the number of techs OnForce purports to have. OnForce has over one hundred thousand techs? Really? A hundred thousand? I don’t think so. Okay, before I go any further, let me explain why this bothers me. I am not trying to pick at OnForce here. This is about the facts. It’s about telling the truth. Some OnForce techs have long chided the platform for “overstating the numbers” when it comes to how many “Pros” and “Buyers” are using it. Many providers are aware of who their competitors are and how many of them are around. Those who have used OnForce for a long period of time also know who most, if not all of the Buyers are, so they know a bogus figure when they see it. OnForce providers already know the facts. No, what this is really about is honesty and journalism, or the lack thereof, and how it affects the marketplace. It’s an accepted fact that bloggers are not held to the same standards as journalists, so source and fact-checking isn’t required. However, Mr. Weiss isn’t labeled a blogger. He’s billed as a journalist. They are, or were, held to a higher standard. Bloggers, for the most part, editorialize. Journalists are supposed to report and stick to the facts. Proper research and fact-checking is what they are supposed to do before they publish the numbers. Now, he did state that OnForce has a database of over 100,000 techs. That officially translates to a roster, or list, if you will of all the techs who signed up for the platform. He didn’t say they were all active techs. But he never goes on to explain that. Instead, it is all left to the reader to make that connection. And he reinforces the number by restating it later in the article. No, the article doesn’t actually say OnForce currently has a full, active complement of 100,000 techs. But by both the omission of key details and repetitive use of that number, the notion is implied. So, if OnForce doesn’t really have 100,000 techs, just how many are there? Why is it even important and why should you even care? Why does the actual number even matter? To the general public, it doesn’t. If you’re a Buyer who routes work through the platform, it does matter somewhat, because the hype can make a difference as to how your work order is taken, who will take it or if anyone will take it at all. To the technician, it makes all the difference in the OnForce “marketplace”. Without going into a long dissertation of the specifics, which are other topics entirely, The “true” versus “promoted” number affects the provider’s leverage when negotiating the work orders and their ability to accurately determine whether or not they have any leverage to negotiate at all. This isn’t based on the tech’s perception of the promoted vs. real number, it’s based on the Buyer’s perception of its own reach within the marketplace. For instance, if the Buyer thinks there are 100 active techs in the area he needs to service, that buyer is inclined to lowball the work order and reject conditional offers. If the buyer knows there are only two or three active techs in that area, the techs have more room to negotiate a rate that is closer to what the actual rate should be and what the tech requires. In short, overstating the numbers can unfairly influence the rates in the marketplace in favor of the Buyer, thus influencing the marketplace itself. To Mr. Weiss’ credit, his article does state the obvious. He added “…after all, with so many technicians in the database and so many work orders, OnForce can often be in a position to drive the service contractor market in an area”. This is no overstatement; on the contrary, it’s an understatement. It is a real, bona fide fact and has long been a point of contention within the OnForce Provider community. How many techs or “Pros” does OnForce really have? I’m not talking about the total number of techs who have joined or even applied since the company was founded. I’m not talking about the number of techs listed on the roster period. They don’t count. How many current, active techs does OnForce have in the United States and Canada? What is the REAL figure? (Hint: we already know it isn’t the number listed in the article and it probably isn’t even close). I posed this question to the OnForce Providers Group on LinkedIn. This is a group comprised of former and current Provider alumni who know the platform very well. Some of them have been a part of it since Day One, when OnForce was called ComputerRepair.com. Since they are the platform experts on the technician side, they know who their fellow technicians are, and who they are not. So I polled them. Among the Providers (I don’t use the term “Pros”) polled, 13 percent said there were more techs than advertised and 6 percent said the number was accurate. Over 80 percent of the Provider alumni polled said there were fewer than 100,000 techs on the OnForce platform. Further comments from Providers indicated the number wasn’t just a little off, it was significantly lower than advertised. In other words, according to the Provider alumni, the number of techs OnForce purports to have on its platform is completely bogus. To be fair about this, I also posed the question directly to an OnForce representative in the group. While the group is intended for OnForce Provider alumni only, the OnForce rep was allow access to serve as a liaison between the group members and OnForce. I even delayed writing this for two weeks in order to give the company ample time to respond. As of the date of this article, he hasn’t. Is confidentiality the reason? Before we start in with the “confidentiality” stuff, let’s set the record straight. First, OnForce freely posted and promoted the number of both Providers and Buyers on its platform in the past in their press releases and on the home page of their web site. These were rounded figures for an obvious reason; since the platform was constantly evolving, these numbers fluctuated constantly. That was a given. Since OnForce has freely thrown around its Provider and Buyer numbers in most, if not all of its PR and marketing campaigns, the “confidentiality” argument doesn’t wash. In addition, the other techs, potential techs and Buyers have a RIGHT to know, because the number DIRECTLY affects their ROI as “customers” and users of the company’s services, the same services that BOTH parties PAY for. If the number is confidential, it shouldn’t be. A couple of members of the OnForce Providers Group on LinkedIn provided a compelling formula and metric to debunk the “100,000 techs” claim. I won’t go into it in this article as it is somewhat involved and requires a separate discussion of its own. For the scope of this article, I will do it the easy way and simply use the company’s own historical, publicly posted numbers to make the case. Up until the end of 2010, OnForce claimed to have around 13,000 techs, or “Pros” as the company calls them. At the time, the legitimacy of this figure was seriously questioned by some of the Providers. One area of concern was whether some techs were counted multiple times or had duplicate accounts and the possibility that the company was not counting techs, but registered accounts. Even if only a small number of the accounts on the platform were duplicate registrations of techs for other cities, that could artificially inflate the roster significantly. The company assured the providers that was not the case and all Providers were only being counted once. The assurances and the company’s overall lack of transparency didn’t stop some Providers from wondering if they were being told the whole story. Sometime around 2006 OnForce decided to “cull the herd” as the Providers put it and cleaned up their active Provider roster. This was done partly to update the system and partly in response to growing dissent in the Provider base and a number of complaints about the discrepancies. This pared the advertised number of Providers to around 10,000, and it didn’t stay there long. Soon after it was not uncommon to hear the number 12,000 bantied about. As of the OSMI Report for Q2 2009 (pdf), the number of Providers was down a bit to over 13,000. The number fluctuated somewhat during the year; in some cases it was touted to be as high as 14,000. While not a significant change, it does indicate the roster had at least returned to its previous size before the purge. In December 2010, OnForce again culled its Provider base in what became known in some circles as “The Great Purge”. Curiously, after this culling, the numbers swiftly increased again, this time surpassing the previous marks by a significant margin. Sometime during 2011, the number of OnForce “Pros” was purported to be as high as 30,000. This figure appeared in one OnForce manager’s public LinkedIn profile. This number is more than double the figure last officially posted by OnForce at the end of 2010. So within one year they now have over 100,000 techs? How is it possible? Given the history of growth at OnForce, it isn’t. Keep in mind that it took from the end of 2003, when the company was originally founded, to 2006, to get past 13,000. From then until at least 2010, save for normal fluctuation, that figure never changed. Suddenly, within 18 months, they have increased their numbers nearly ten fold? No way. Another clue the number is bogus: the competition. Their primary competitors are Field Nation and Work Market. Those and a couple of other platforms have grown considerably in the marketplace within the last few years and are giving OnForce a run for the money, and they don’t claim to have 100,000 techs combined. The final clue lies with the Providers themselves, or more specifically, their “Pro IDs”. Each OnForce Provider is assigned an ID number, and this number has historically been assigned sequentially. If your “Pro ID” is 1150, you were the 1,150th tech to sign up and you’ve likely been with OnForce since it was founded as ComputerRepair.com in 2003. My Provider ID is 5259. I joined OnForce in May 2004. There were just over 5200 techs on the platform when I joined. Today, the “Pro ID” is six digits. The highest number I recall seeing to date is around 140,000. Okay, 140K? That is considerably larger than 100K, so the number is actually greater! Hold on. Not so fast. Remember, I am number 5259. However, I am no longer listed on the OnForce platform as an available tech, and I have not been active since two years before I was booted from their forums. In other words, I am no longer an OnForce Provider. I don’t count. Yet, I am still counted. And I am not alone, either, because there are tens of thousands of other former Providers just like me. Some have left on their own. Some have been suspended for a specified or unspecified period of time. Others have been banned or booted. They no longer show up in the system. Yet they are still in the database and are still officially counted! In other words, OnForce may have culled their list of active Providers, but they are not removed from the database, effectively and artificially raising the official Provider count! In addition, there are many Providers who are listed as active on the platform, yet have never accepted a single work order. I was still listed as active until The Great Purge of 2010 and I had not performed any work for them for nearly three years! I wasn’t active, yet according to OnForce, I was! I just performed a search for Providers within an 80 mile radius of my area. Guess what I found? Out of 114 techs listed, nearly one-third have never accepted a work order. Not one. This was no surprise to me, as I have performed that search many times during the last eight years in many areas and the results are generally the same. On average, about one third of the techs listed have never run a single work order, meaning that those techs are usually not active. There are reasons for this. The most common scenario is that a tech will sign up as a Provider and, for one reason or another, just move on. Whether they actually participate or not doesn’t really matter when it comes to the numbers. Each one is still added to the database and counted. A few years ago I challenged their Provider count in the OnForce forums. At the time the count was somewhere between 12,000 and 14,000 techs. Based on my own calculations and those of other forum members, I argued that the actual number of techs was considerably less. I do not recall the precise number but it was less than half the figure OnForce advertised. It was finally admitted by one of the OnForce reps that the advertised number was not accurate and my number was not far off the mark. Let’s be real. OnForce does not have 100,000 active techs. Sure, over 100,000 techs may have signed up on their system during the past nine years, but some of them are no longer actually on the platform for one reason or another and among those who still are, at least a third probably aren’t even active. I should know, I was one of them. So how many techs does OnForce really have? The truth is, no one outside of the company really knows the actual figure. OnForce, the service platform that purports to be “transparent”, is itself a private company and the actual figures are apparently now a big secret, since there was no response to my official inquiry. What do you think? Do you agree that the number of techs on the platform quoted in the article is correct? If so, why? If not, how many techs do you think OnForce really has? Of those, how many are active? This post is a little different than our usual lineup as I would like to talk about the Technibble site itself. Back in 2006 Technibble originally started on a shared host but as we became more and more popular, it began eating up most of the servers resources to the point where we were about to get kicked off the shared hosts servers. Soon afterwards I migrated Technibble to a dedicated server which ended up serving us well for a few years until we started overloading that server as well. In order for us to keep up with the traffic, we moved to cloud hosting where the site gets whatever it needs when it needs it. Of course, this costs even more money. Technibble grew into something beyond what I could handle on my own so now we have a team of writers and a dedicated customer support person who have been great. Of course, this also costs money. I plan on keeping front page content free forever but there are bills to pay and Techibble advertisers help offset some of these costs which I am thankful for. That doesnt mean I allow just anyone to advertise with Technibble. I have had plenty of “How I lost a bazillion pounds in 4 days” and “Win an Free iPod!” type advertisers approach me and I tell them where to go. Technibble advertisers have to be solid, computer technician targeted products or services. Its all about keeping it relevant. I am also big believer in under-promising and over-delivering (important for any business) so I would like to give the Technibble advertisers a little extra exposure. I would also like to help our readers by showing people like yourself what products are out there that could help you with your businesses and make you more money. CommitCRM is a professional service automation (PSA), CRM, service, dispatching, contracts and billing software solution designed specifically for small to mid-sized IT Services Providers. You can test drive CommitCRM here. MHelpDesk is a service management application which helps you monitor, track and manage your service requests. It helps you organise your issue tracking, scheduling, invoicing, customer calls and more. Quickly access client notes, contact info and service history – MHelpdesk organizes and puts all your customer data at your finger-tips. You can test drive MHelpDesk here. ScreenConnect is a self hosted remote support application. One of their main selling points that their licenses are ONCE OFF, as in, no monthly fees. Their licenses start at $275 and you can run that version for as long as you wish. You can test drive ScreenConnect here. RepairShopr is a web based shop/business management tool to help you keep track of your customers and employees. You can test drive RepairShopr here. D7 is a PC technician’s multi-tool designed for one click automation in all repair scenarios. Keeping all of your tools updated! You can test drive D7 here. Instant Housecall have created remote support software that is designed to be as easy as possible for your client to get running on their end. It also has built in branding and payment options. End of session management – Automatically send emails with session details, send customers to a webpage of your choice etc..
You can test drive InstantHousecall here. If you would like to advertise with Technibble, check out our advertising page here for our stats. Some of the advertisers like CommitCRM have been advertising with us for years which is proof that Technibble advertising works. As Computer Technicians, occasionally we need to dive into the registry to make some changes such as removing registry keys that a virus or some software left over. Of course, it is always a good idea backup the registry before you make any changes in case something goes wrong. 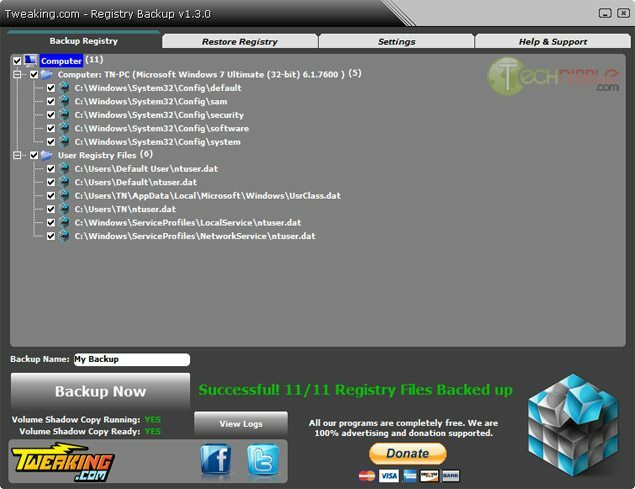 Tweaking.com’s Registry Backup is a free tool that makes backing up and restoring the Windows registry easy. In the past, many technicians used ERUNT to do this task but unfortunately ERUNT hasn’t been updated for many years. One of the main features that Tweaking.com’s Registry Backup has over ERUNT is that it makes use of the Windows Volume Shadow Copy Service (VSS) to create its backups. 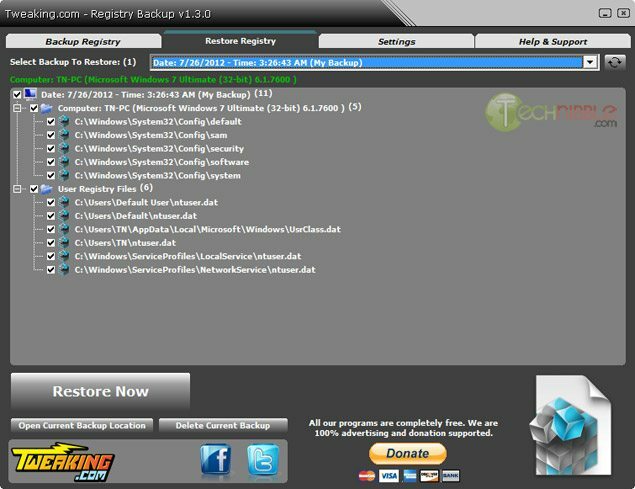 This is the recommended backup method by Microsoft as it is deemed safer than RegSaveKey function which ERUNT uses. The application comes with a portable and installer version, it can restore the registry from Safe Mode and it maintains detailed logs of the work it has done. 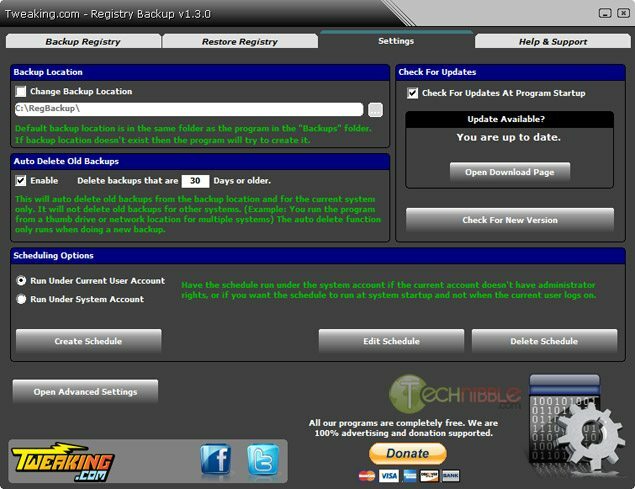 Registry Backup can also be used as an ongoing registry backup solution as it allows you to schedule backups.